In this week we will allow lace making to nudge us into contemplative space as we create beauty at one with the Divine Artist. We will also take time to consider God’s loving creativity in our lives through poetry — our own and that of others. 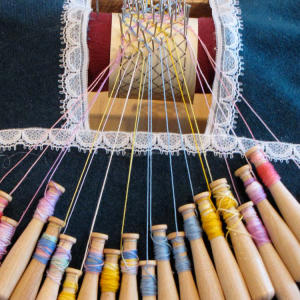 Each day will include instruction in bobbin lace making, both for those new to the craft and for those with some experience with it. Retreatants can also expect a comfortable private bedroom, home-cooked meals fresh from the garden, daily communal prayer and communal conversation, as well as daily spiritual input and a reflection guide for personal prayer. Sunday, 5:30 p.m. supper – Sunday, noon meal. Cost: $550 (plus materials). PO Box 675 / 323 E. 5th. For quick information about rates, amenities and other handy need-to-know items, CLICK HERE. Sisters of St. Joseph of Concordia, Kan. The Sisters of St. Joseph of Concordia, Kan., 'love God and the dear neighbor without distinction.' And when you walk through the doors of Manna House of Prayer, you become a 'dear neighbor' blessed to have found this special place.